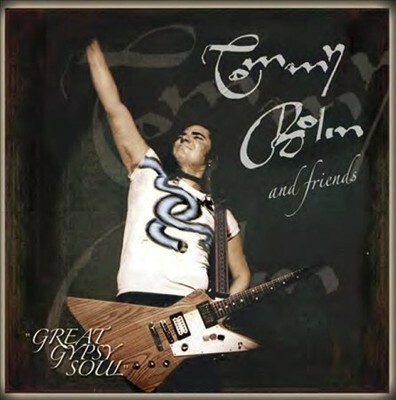 An impressive roster of players have signed on to pay tribute to Tommy Bolin called Great Gypsy Soul. Produced by Greg Hampton and Warren Haynes, it’s a project that brings together major players who actually perform alongside Tommy Bolin’s playing and vocals from the recording outtakes to his solo debut album, Teaser. Peter Frampton, Warren Haynes (a key supporter of the project), Nels Cline, Steve Lukather, Steve Morse, Brad Whitford, Joe Bonamassa, John Scofield, Derek Trucks, Glenn Hughes and Myles Kennedy all contributed to the project. Great Gypsy Soul will be released on 429 Records on March 27th in both a single CD format and double CD with bonus tracks. A series of promotional concerts are also in the works. Many of the guests added after the fact have a close personal connection to Tommy – all share in acknowledging his place in rock history. Watching (and hearing) it all come to fruition some 35 years later was a journey of its own – well worth the travel. Posted by Nick Soveiko on Wednesday, January 18th, 2012, filed under News. You can follow comment on this post through the RSS 2.0 feed. You can leave a comment below, or trackback from your own site. Tommy is the most underrated guitar player ever (vocalist , producer, songwriter) of the story…what a genius he was…’Teaser outakes, “from the archives vol.1” and “wishper and roses vol.1” testify it…but there’s no justice in tis world…everybody knows it..
Gotsta love the Purple connections including good citizen Mr. Morse! This should be an interesting piece of work. The bonus Disk looks the most intriguing. I’m really looking forward to this. Some great players taking part. Warren Haynes is the highlight for me here. I’ve seen him with his band ‘Govt. Mule’ a few times. Talk about a Jam Band. On average….3 hours Live. If they come within 1000 miles of you, GO!! Interesting that things like this can be judged so positively. Only one DEAD member combined with “outsiders”. Is that much different from acts that still continue without original members or , for example, Over The Rainbow that tries to pay hommage with 4 ex members and no bandleader Ritchie but Jurgen? Btw, before “someone” jumps at me, I did NOT say I m not able to enjoy projects like this. Although, in general, discs like these get shelved too often after a spin or 2 . The difference here is that a great cast of musicians are taking Bolin’s material that he actually partook in and performs on and are giving him tribute by taking these ‘unfinished’ recordings and joining in with HIM in homage to Him. They are not taking on a ‘name in vein’ as with OTR trying to ‘capitalize’ on their ‘connection’. On the contrary. None of these guys are ex-Bolin Band members trying to regain their personal spotlight and tarnish the brand. They are fellow musicians whom respect his contribution to the craft and only wish to say THANKS. This is an honest gesture of giving attention and tribute to one whom truly deserves the recognition for his short lived talent. As a rule,I’m not big on these tribute deals,but Steve doing Crazed Fandango?It may not work,but this I have to hear. As Tommy was fond of jamming with musicians from a multitude of genres (see Greg Prato’s Bio- Touched By Magic), I view this as a welcome continuation of a life cut way too short! Let’s embrace the the effort of many gifted players to highlight an amazing but underappreciated talent!!!!! Can’t wait to hear some of these tracks, Teaser is one of my all time favorite vinyl’s. Tracy @6 VERY well said.. I need to hear this. NOW. Too often great music is made for the garbagebin because the instrumental sections are not endorsed by a good vocal. I love, for example ,Michael Schenker but I m not eager to go to a gig or listen to a cd when the singer appals me. At shows I witnessed MS fans standing near him, just focussing on what he does. And I could imagine it the more because MS had hired AGAIN a screaming nobody!!! Playing great classic songs combined with a good instrumental section helps ofcourse. There is often still much joy to gain from deciding to ignore irritation caused by the singer. But to me it becomes a love-hate experience that way. The Rainbow DIO years would not have been that succesfull and timeless without his contributions. The Stranger In Us All produced an album with many great songs and on stage those songs were great as well. Although Doogie is-was able to perform songs from all era´s…….It is unavoidable comparing them to DIO. I saw that 1997 show with Micelli on drums. I often dont understand Ritchie´s choices and this was one of them. Kinda enjoyable that WHITE NOISE dvd by Doogie and otrhers, but ……THAT DRUMMER!!!! I seldom saw such a lame endorsement by a drummer in a rockband. Bryan Josh ofcourse was splendid in that performance. Songs made to be delivered by someone who knows what rock is, what Blackmore´s songs are, what the songs need. I love Tommy´s own voice. Unfortunately we can´t yet reproduce that so that we can complete unfinished songs. Let´s hope they are willing and able to get in some other GREAT, meaning NOT nice, singers as well. Hitting the nail on the head. Amen…. She’s a ….teaser, & wild dogs in the night has me interested, hope both are acoustic versions. Great guests also. but you can’t beat Tommy and his original musicians/magicians on their own songs…anyway professional project, I like it! Great tribute CD with a fresh stamp from all the guest on the list. Steve Morse ROCKS the house with Track 10 — Crazed Fandango ! Derek Trucks slice on Track 5 — Smooth Fandango. Cerebral. Sir Glenn Hughes a first time release for a hidden gem: SUGAR SHACK!! Sir Glenn & Little Joe ……….Lotus. Classy, indeed. Some serious players on this CD, let’s get jazzy! !